An investment whose credit rating has been downgraded to below investment grade or subsequent downgrades from below investment grade rating is eligible to be segregated. Investors in mutual funds got an added layer of protection when capital markets regulator Securities and Exchange Board of India (Sebi) allowed funds to segregate debt instruments that see a downgrade in credit rating into a separate portfolio. The idea of isolating toxic assets from a debt investment is to protect the rest of the portfolio and its investors from the consequences of a downgrade or default in one security. Typically, a downgrade or default event sets off large-scale redemptions, forcing the fund to sell the good assets to meet redemptions, leaving the poorer quality instruments that are illiquid in the portfolio. Retail investors are usually the ones left holding the illiquid units in the end and bear the brunt of the event. “Segregation ensures a more equitable treatment to all segments of investors as compared to writing down the investment value at one shot or in a phased manner in the original portfolio," said Avnish Jain, head fixed income, Canara Robeco Mutual Fund. “While the NAV and the value of the investors’ holding will take a dip in both cases, immediate segregation will to a large extent pre-empt a situation where informed investors will be able to exit early leaving smaller investors to suffer the consequences of the credit event," he added. An investment whose credit rating has been downgraded to below investment grade or subsequent downgrades from below investment grade rating is eligible to be segregated. If different rating agencies give different credit ratings then the lowest rating will be considered to decide whether the instrument is eligible, under these guidelines, to be transferred out of the scheme’s portfolio. The creation of a separate portfolio is optional and at the discretion of the asset management company (AMC), with the approval of the trustees. To limit panic redemptions, Sebi has mandated that till the trustees’ approval is received and the downgraded investment is transferred out, redemption and subscription will be suspended for a maximum of one day. Once the trustees’ approval is received, the segregated portfolio is created on the date of the downgrade by transferring the affected instrument at its current realisable value to this portfolio. The original scheme is now divided into two portfolios—the segregated portfolio that holds the distressed investment and the main portfolio that holds the remaining assets. All existing unit holders in the main portfolio will get the same number of units in the segregated portfolio. Though the number of units held by an investor across the two portfolios will double post-segregation, the total value of the investments will remain the same on the date of transfer. That is because while the NAV of the main portfolio will come down to the extent of the value of the investment that is transferred out, this is made up for by the NAV of the segregated portfolio into which this asset is transferred. The NAV of both portfolios will be calculated and declared for each day from the day of the transfer. No subscription or redemption will be allowed from the segregated portfolio. Its units will be listed on a stock exchange to provide an exit option for unit holders. The AMC is required to make efforts to recover the investments of the segregated portfolio. Any amount recovered will be immediately distributed to existing investors in the proportion of holding. The segregated portfolio will be wound up when the dues are recovered or the instrument is written off. Any recovery even after an instrument is written off will be distributed. Joydeep Sen, founder, wiseinvestor.in, finds segregation rules fair for investors. “If there were no segregation and the fund wrote off the distressed investment from the books, the existing investors bear the brunt of the fall in NAV. Subsequently, if there was some recovery and the NAV appreciates, the benefit will also go to new investors who bought into the fund after the credit event. This is not fair on investors who took the hit initially, some of who may have also exited the fund before any recovery is made," he said. He is not sure, though, if the one-day window that AMCs are allowed to make the decision to segregate is adequate to get all the stakeholders together. The main portfolio will be operational as usual. Subscription and redemption will continue in the main portfolio at the relevant NAV. One of the reservations was that the facility to segregate will encourage fund managers to take excessive credit risk knowing that they can remove the asset if it goes wrong. But the guidelines ensure that the use of segregation will have negative consequences for the fund. The fall in the NAV of the main portfolio after the segregation will mean a fall in the returns of the scheme. This is likely to act as a deterrent. Also, funds can’t charge investment and advisory fees on the segregated portfolio and fund managers and others involved in the investment process of securities may have to proportionately forfeit their performance incentives. The total expense ratio and legal fees can be charged on a pro-rata basis only when there is any recovery in the segregated portfolio and no expenses related to the segregated portfolio can be charged to the main portfolio. “Fund management will be careful with the risks the fund takes to enhance returns and instead focus on managing and tempering investors’ return expectations," said Jain. 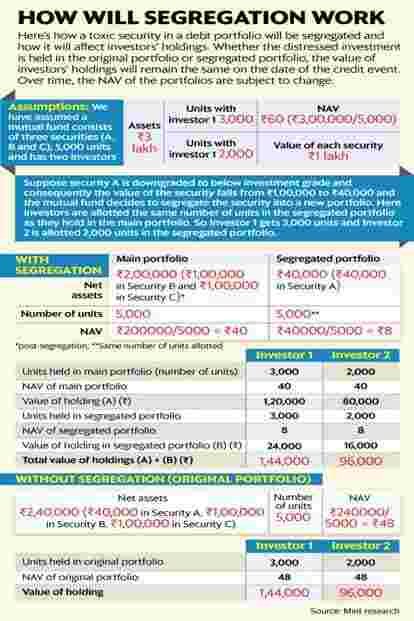 The fact that segregation was done in a mutual fund is an important information for new investors. To this end, Sebi has mandated that information about the segregated portfolio should appear in all scheme-related documents, portfolio disclosures and annual reports, advertisements and the websites of Sebi and the AMC. This is one more data point for investors to evaluate while determining the suitability of a debt fund.